% EPL activities also play a critical role in development of self-esteem and self-worth in a child. As the child develops basic abilities and a greater sense of self-worth, he/she becomes more open to trying out new things and taking up new challenges. % Another focus area of EPL activities is development of bodily functions and motor skills. As the child practices EPL activities, his/her fine and gross motor skills get refined. This also leads to better hand-eye coordination. % These are the senses of sight (visual), smell (olfactory), touch (tactile), taste (gustatory), hear (auditory), weigh (baric), hotness (thermic) and perceiving without seeing (stereognostic). % These activities also indirectly introduce mathematical concepts (such as algebra, geometry, arithmetics) and help prepare for writing. Many of the sensorial activities also incorporate age-appropriate exercise of muscles that leads to physical development. % Sounds (phonics) are introduced first, followed by combining and splitting of sounds for formation of words. This results in non-rote learning of words/spellings, which aids independent reading. Writing is introduced thereafter, by starting with the physical preparation of the hand/muscles. % The mixed-age-group environment - a unique characteristic of Montessori pedagogy - helps in better adjusting and expressing one-self in a social setup. This also leads to higher confidence levels and better teamwork. % The activities begin with introduction to quantities and relative sizes. Numerals are introduced later as symbols that represent quantities. Manipulation of the numbers with operators such as addition, subtraction, division and multiplication are introduced thereafter. % Geometrical shapes introduced as part of EPL activities prepare the child for intuitive understanding of geometry. These preliminary concepts in combination with the mathematical concepts act as a foundation for later study. % These also include concepts of water bodies in relation to land bodies (such as an island, a river, a lake, an archipelago etc.) that are introduced with the help of physical models. % Furthermore, the culture activities include basic biology/botany such as parts of an animal, an amphibian, a fish, a flower, a plant and a tree. 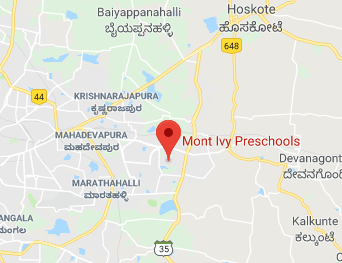 This is copyrighted material of Mont Ivy International Education / Mont Ivy Preschools (www.montivy.com). This can be freely reproduced, but only with due credit and link to this page. COPYRIGHT © MONT IVY INTERNATIONAL EDUCATION. ALL RIGHTS RESERVED.